Adam: I never expected to meet someone like you on the road. Art: No one ever does, Adam. No one ever does. Cruel and Unusual is a moderately entertaining serial killer thriller set in the perpetually foggy and windy Pacific Northwest. A film featuring Tom Berenger as knife-wielding murderer can't be all bad, and this one does have its moments, but it is marred by another of those insipid climaxes that left me feeling more than a little ripped off, and one that tainted the preceding ninety minutes. This really isn't a bad film, it's just that I wanted a more fitting conclusion than what director George Mihalka (My Bloody Valentine) was apparently set to deliver. Before the first twenty minutes are up, Art Stoner (Berenger) has murdered two people, and has assumed the identity of one of his victims, a divorced literature professor/writer named Adam Turrell. Art/Adam proceeds to a small coastal town somewhere north of Seattle, where the real Adam had been heading, to spend six months living in a lighthouse, presumably to work on his novel. Once there, Art finds out his roomie at the lighthouse is whiny twenty-something Mike (Tygh Runyan), a guy who is struggling to mend a troubled relationship with big sis Kate (Rachel Hayward), one of the town's rugged fisherwomen; Hayward is perfect in this role, as she really looks the part (check out those arms!). The dynamic between lazy slacker Mike and cool, calm killer Art is one of the more enjoyable elements of this film, and as the story progresses their relationship becomes more than a bit strained, and downright dangerous. Mike's concerns about Art prompt a nice undercurrent of ever-increasing uneasiness, especially when he is unable to convince anyone (re: Kate) of his suspicions; Art is a shifty devil, and he manipulates a number of situations so that Mike is made to look crazy. Berenger plays the role of Art with one of those good ol' boy twangy accents that is meant to be reassuring and comforting (he does successfully woo Kate), but it's clear that he's just a powder keg waiting to blow. Tygh Runyan's portrayal of Mike is believably low-key, and most of his actions and reactions seem natural, under the conditions. He doesn't offer up any non-characteristic heroics, which so often happens in films like this. Visually, the film is fairly dark and moody, and Mihalka fills the screen with a naturally evocative locale that features a persistently overcast sky and a howling wind that is so dominant it made me want to turn up the thermostat a few degrees. This is where the aggressive 5.1 Dolby Digital mix that Columbia TriStar has packaged on this disc really enhances the film's appeal greatly. Everyone looks pretty cold, ruddy and miserable, and the inclement weather is accented well by setting most of the story in the remote lighthouse, where Art plays out his deadly mind games with Mike. I'll admit I enjoyed the premise of Cruel and Unusual, and Mihalka presents the material effectively. It moved along nicely, with the requisite building of tension and suspense, only to falter in the final moments. Look for it on cable and you might not be disappointed, and as a rental you'll probably appreciate the impressive 5.1 audio mix. Image Transfer Review: The 1.78:1 anamorphic widescreen transfer is free of any annoying specks or blemishes, and sports an icy, cold color palette that gives a nice edge to the windy Pacific Northwest coastal locale used in the film. Fog shots reveals some minor grain, but nothing overly distracting. Black levels aren't very strong, resulting in some indecipherable sequences where shadows became tend to become a big, dark blur. There are some compression issues here, and are most notable on exterior shots. Audio Transfer Review: Excellent job from Columbia TriStar on the 5.1 audio transfer! This is a highly aggressive sound mix, laden with a variety of active surround cues and pronounced imaging, and while it doesn't necessarily improve the script any, it does make the viewing experience more fun. From the thunder and rain in the opening sequence, to seagulls, ringing buoys and creaking boats, the audio transfer really is pretty impressive, and generates a pleasantly surprising sound stage. At one point, Rachel Hayward's character has a flashback scene where various voices swirl around, with a distinct voice coming from each speaker. A slightly less punchy 2.0 surround track in English is also included, but it is lacking in the depth of the 5.1 mix. Extras Review: Not much here to sate your supplemental desires. A photo gallery of 22 images is included, and features a mixture of production stills and behind-the-scene shots. The remaining extras are five trailers (Cruel and Unusual, True Blue, Proximity, Bare Witness, Zebra Lounge), subtitles (English, Spanish), 20 chapters and cast filmographies. This is a good looking film, with an excellent audio transfer, two believable performances (Runyan and Hayward) and one that's almost over the top (Berenger). 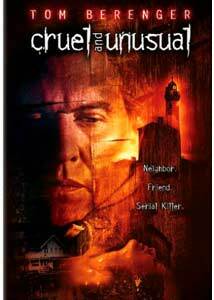 Cruel and Unusual might have been a better film had it not tossed out a lazy and unimaginative third act, because I actually did find myself enjoying the first two-thirds.